Since La Paz Group started working in Kerala last year, we have been in learning mode, especially with regard to cultural traditions. 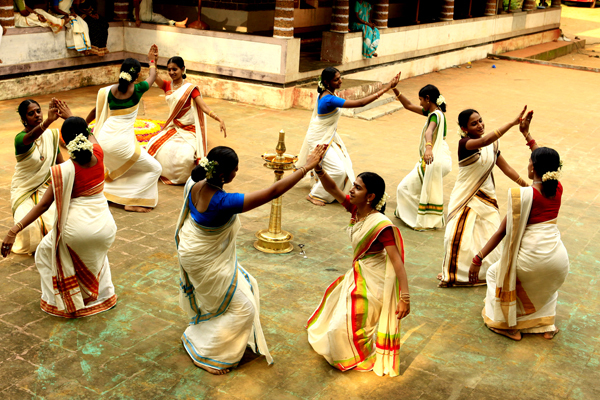 Dance is an essential part of Kerala’s cultural fabric. 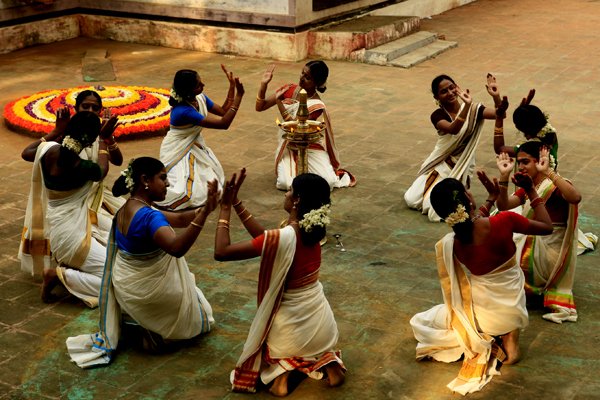 Thiruvathira kali is one of the typical dance forms here. This is a female group dance made up of simple, elegant steps. In ancient times, women performed this dance in their homes during festivals and functions, giving it the Malayalam name aka Kaikottikali: aka-inside + kaikottikali-play claping hands. Lore has it that Thiruvathira Kali is remembering Lord Siva taking Parvathi as his wife. The group of women dress in typical Kerala style — mundu and neriyathu and the hair in a bun, adorned with jasmine garlands — and perform this dance during festival seasons. Kaikottikkali spreads the message of joy and also illustrates the emotions of a married woman towards her beloved and of the unmarried woman longing for one. The dance follows a circular, pirouetting pattern around a traditional lamp, accompanied by clapping of the hands and singing. Thiruvathira songs are melodious and well-known. One of the performers sings the first line of a song while the rest repeat it in chorus, clapping their hands in unison. The tune and the lyrics are very sweet and simple and are related in many ways to everyday life. During Onam, the most important festival of Kerala, we can watch this dance often. This dance is also performed on the occasion of Thiruvathira day of the Malayalam month of Dhanu (December- January). Thiruvathira Kali is considered to be a ritual performance and the celebration of complete happiness. So glad! Stop by again soon! Hi Sonia, thanks for the comment. If you’re a facebook user we’d love for you to “like” our page. See you there! Can you please update lyrics of anyone thiruvathira song ?